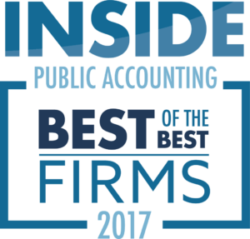 In August 2017, INSIDE Public Accounting’s (IPA’s) annual Best of the Best recognition honored 50 CPA firms across the country for their overall superior financial and operational performance on more than 70 IPA criteria. The right combination of planning, strategy and execution distinguish Best of the Best firms from among more than 587 firms that participated in IPA’s 27th Annual Survey and Analysis of Firms. The IPA Best of the Best firms come in all sizes – from 26 employees to 2,400 – and are geographically dispersed across the U.S. and Canada. “Best of the Best firms are financially successful, but that’s only part of what makes them exceptional,” says Michael Platt, principal of the Platt Group and publisher of the accounting trade publication, INSIDE Public Accounting. “Best of the Best firms are built on a strong foundation that consider the needs of staff, owners and clients as the three key constituencies of any successful business. They are not content to stand still. They plan ahead for the future of the firm and they anticipate the needs of their clients.